You can recruit anywhere, anytime. Begin with family, friends and colleagues. You can recruit at your chapter meetings. You can attend events by other organizations and speak to them about NSS. You can attend festivals and fairs with an NSS table, presenting your vision for space to the public at large. Always get permission in advance. Ask if they have chairs, tables, display boards and electric outlets, if needed. Be prepared to send them an information sheet about your chapter, an NSS brochure, your newsletter, an Ad Astra, etc. along with a formal letter requesting permission. Find out when you can setup and take down your booth, who your contact person is and if you have permission to sell materials and memberships. Even a few colorful pictures on an exhibit board behind your table will attract people. For more elaborate displays you can include three dimensional items like models, colorful space books or a rear-projection slide show. Include a prominent poster about your next meeting or event (see Exhibits below). Try to schedule at least two people at all times. If you cannot adequately cover your booth at certain times, such as during weekdays, cut down on the hours or number of days. Pair new workers with more experienced ones. Assign a set-up and close-down person to the first and last time period of each day who will take care of the cash box and other valuables. You must have something with your group’s name, address and phone number, possibly including membership information and a brief description of our purpose. However, you do not want the site to be littered with paper that has your group’s name on it, especially since you paid to have it printed. So, avoid giving handouts to young children or obviously uninterested people. Chapter newsletters, Ad Astra, a list of your upcoming events, and information sheets about specific space topics are all useful handouts. To avoid waste, do not give these away, but charge only a token amount — the “price” could be filling out and returning your survey. Handouts are better than an information sign-up sheet if you want to limit mailing expenses. This is probably the best thing you can have at a booth. It draws people in, gets them thinking about space and adds to your contacts and membership. Be sure to include a place for their name, address and phone number. As always, clearly mark OVER on the bottom if it is printed on both sides. Date the questionnaires for your own reference. Try to carry items that reinforce your goal: space posters, NASA literature, T-shirts, buttons or books. Remember inexpensive items if there are likely to be many children present. Keep careful track of your cash flow, and tally your money and goods each night. If you are not allowed to make sales at the site, you could include a merchandise list in your handouts. In a mall you can contact a book store in advance. They may want to prominently display space books and magazines and may even donate copies for your exhibit (and later your library) if you tell people where they can get them. Be sure to have a place to keep your materials overnight, if the booth will be up for several days. Keep items such as cameras, projectors, slides and films, extra cash (and purses) locked in an office, cabinet or car when they are not in use. Keep a close eye on the cash box, merchandise, models, sample literature, books and even your posters! If your booth is outdoors, bring paper weights or sheets of plexiglass to keep papers from blowing away. Models will need special protection from the wind. A sun shade, umbrella or plastic drop-cloth may save your day. Good close-up photos of your booth will be useful to evaluate its impact and to help in planning future efforts. Get shots with lots of people for your Chapter’s Presentation Book. 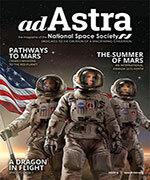 Allow enough time to send for NSS brochures or copies of Ad Astra, to have handouts printed or to make posters. Your people also need time to arrange their schedules and transportation. message of space utilization to the politicians and staffers who use them. Shopping malls are ideal. They may provide free-standing display boards and tables, let you sell merchandise, or they may even advertise your exhibit. Do not overcommit your chapter, but it is all right to do a small exhibit if the mall knows precisely what you have to offer. How many people will see the exhibit? Can you have a booth? Can you sell material and/or memberships? Does the site provide mounting space (walls or free standing peg boards)? How much time is there to prepare for the exhibit? How much material will be needed? Can your workers get there without too much difficulty? or if display panels and tables must be rented. Introduce yourself and state that you are calling for the ___ Chapter of the National Space Society, a non-profit international organization devoted to public education about space development. 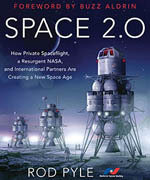 State that your organization can provide an exhibit about the space program and future uses of space. Describe the exhibit materials which will be available. event or a space observance proclamation. If your group has provided exhibits at other sites you can mention these. stations and large satellites, which sound more realistic to an uninformed public. to present to them. Follow points one through six in preparing your request. materials. This may be scheduled during the phone call or in response to your written proposal. out of a working day. It may be possible to visit several potential sites in one day if that is the case. that yours is a responsible, professional-caliber organization. This cannot be recommended strongly enough. provide incentive to your contact to make sure that his site also sends you formal letters to be included in the book. of THIS exhibit in the book. help to prevent misunderstanding at the time the exhibit is set up. permitted to use to set up; tacks, velcro, tape, etc. arrangements for its models, so find out in advance. Can you tie in with a local or national event such as Space Week? Will libraries provide reading lists and advertising for your exhibit? Can you coordinate talks at a library or elsewhere during the exhibit? Will schools send groups of classes? Will stores in the mall or surrounding area carry a space theme during the exhibit? Can you share exhibit space and costs with related organizations? keeping all appointments and be careful not to annoy by creating disturbances or blocking passages. Verify site arrangements before you arrive to set up. Decide in advance how your materials are to be fastened to the mounting surface. other information about your chapter. Put handouts with your chapter name and address in a holder on the wall or at a booth. method, it shows what can be done if you are determined. understanding (read: professional) when you call to cancel, your throat is cut. a gaggle of insignificant sci-fi freaks is entirely up to you.